There’s something completely satisfying about making a really good vegetarian dish that would win over the biggest meat eater. Especially a good amount of veggies and beans with a punch of bold spicy flavours! The combination of chocolate and chili is utterly delicious. I put a hind of cayenne pepper in my brownies, chocolate muffins, hot chocolate, everything with chocolate. 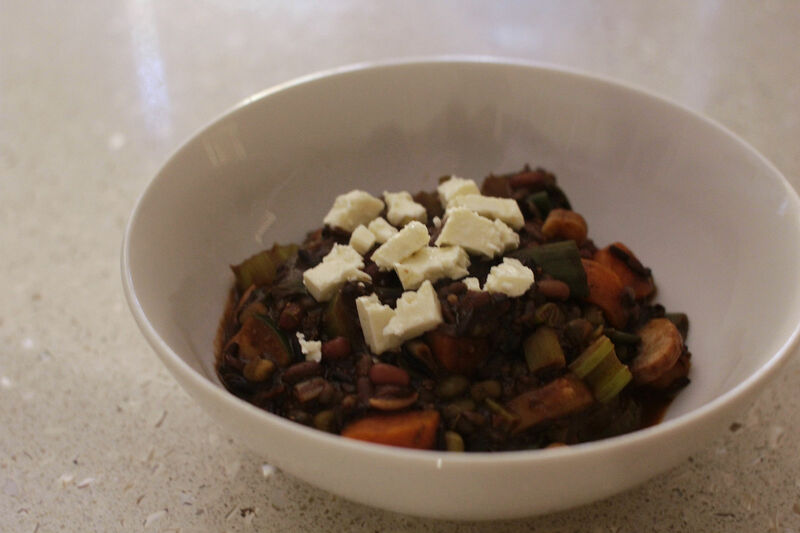 So here we have a healthy, vegan, gluten-free, awesome choc-chili. Soak your rice overnight. Drain, rinse well and set aside. Heat coconut oil in a large pot over medium heat. Add garlic and onion and saute for a couple of minutes. Add chopped vegetables, rice and all spices in and stir to combine. Add water or stock and bring it up to boil. Simmer for 30-40 minutes until cooked. Transfer to a serving bowl and top with olive oil and crumbled feta. You can have it by itself or serve with pita chips.